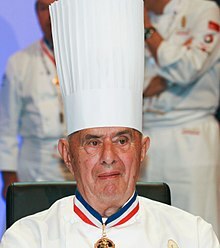 ^ "Paul Bocuse, le pape de la gastronomie, est mort". ^ "A First for the Michelin Guide: Three Stars for a German Restaurant; Making a Choice 'Can I Do Better?'". New York Times. ^ a b "Paul Bocuse, Celebrated French Chef, Dies at 91". New York Times. ^ "Chef of the Century". 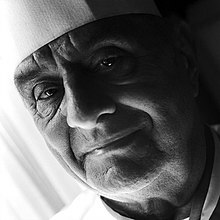 ^ "'Pope' of French cuisine Paul Bocuse dies at age 91". ^ "MICHELIN GUIDE FRANCE 2017 – THE FULL LIST". ^ a b "Nos maisons". ^ Scott Joseph (17 July 2008). "Prestigious Bocuse d'Or competition to be part of Epcot Food & Wine Festival". Orlando Sentinel. Archived from the original on 14 October 2008. Retrieved 17 July 2008. ^ "Paul Bocuse, Co-Founder of Les Chefs de France, dies at 91". disboards.com. Retrieved 22 January 2018. ^ "Biographie de Paul Bocuse". ^ a b "12TH YEAR OF THE INSTITUT PAUL BOCUSE WORLDWIDE ALLIANCE". OnlyLyon. Retrieved 11 January 2018. ^ "Paul Bocuse, le pape de la gastronomie, est mort". Le Point (in French). Retrieved 20 January 2018. ^ Grimes, William (2018). "Paul Bocuse, Celebrated French Chef, Dies at 91". The New York Times. Retrieved 20 January 2018. ^ Bocuse, Paul (12 October 1977). Paul Bocuse's French Cooking. ISBN 9780394406701. ^ "Bocuse a la Carte". This page is based on the Wikipedia article Paul Bocuse; it is used under the Creative Commons Attribution-ShareAlike 3.0 Unported License (CC-BY-SA). You may redistribute it, verbatim or modified, providing that you comply with the terms of the CC-BY-SA.